I am conducting some interesting operations from the Soviet side, using Armored Brigade's powerful scenario editor. My topic during the last few days was Soviet Forward Detachments, the mainstay connection between tactical combat and the conduct of deep battle at the operational level. These combined arms formations conducted pre-emptive strikes into the ENY's tactical depth in order to secure terrain needed for the conduct of operations by bigger units. Of task-oriented composition (a Soviet kampfgruppe?) and relying on speed, they would move within ENY territory, with their commanders making tactical decisions on the spot. This flexibility in tactics was pointed out by David Glantz, from whom a superb treatise on these formations has been available for a while. 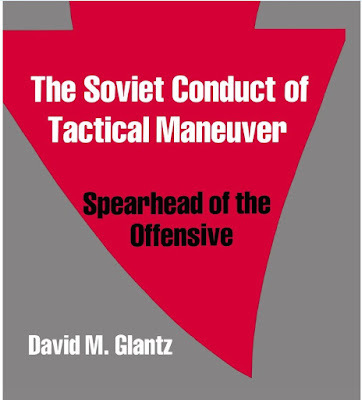 The Soviet Conduct of Tactical Maneuver: Spearhead of the Offensive (Soviet (Russian) Military Theory and Practice Book 4) by David Glantz. Available from any major bookstore. 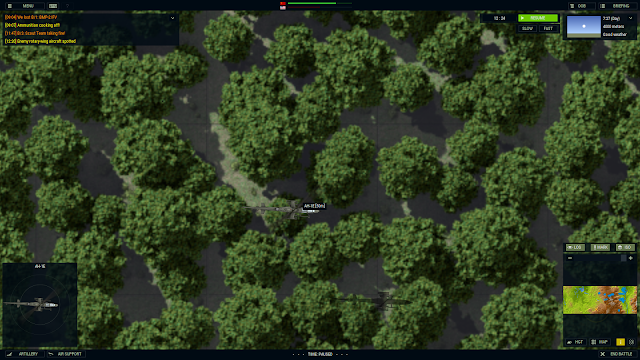 For my Armored Brigade scenario, I assembled a forward detachment around a tank Bn(-), plus a company of IFVs, self-propelled air defenses and self propelled artillery (18 tubes). The use of artillery is deemed as one of the crucial factors determining the success of the forward detachment and I wanted to check how fast the Gvozdikas can save my day. The mighty Gvozdika (lower left informational panel) is being put to the test. Critical vulnerability: ENY air. In this case, a US attack helicopter. This is mentioned in many publications as one of the worst concerns for the commander of a forward detachment. Indeed, the tactical commander is instructed to make provisions to replace recon units as their unlikely to survive the onslaught by ENY air. And massive firepower rained on the ENY. The Gvozdikas at work delivering substantial firepower to ENY positions from which we just received fire. It took roughly 3.5 minutes to get the shells into the ENY position, from sending the order to the actual fire mission impacting the targets. Great, flexible and timely indirect fire support. As a side note, the computer opponent placed itself in front of a great kill zone. 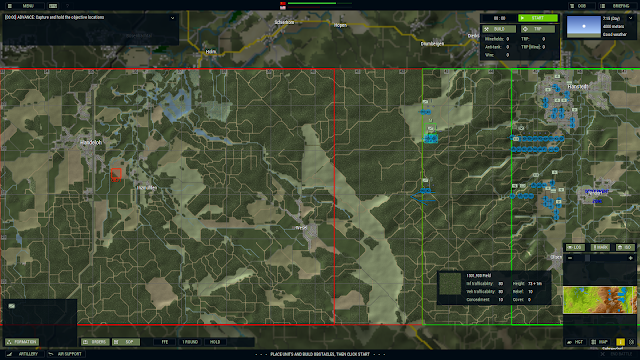 Kudos to Armored Brigade for that. Another side note: I used my two T-72 tank companies as a whole (i.e. not as individual platoons). I guess sometimes I get a bit overtaken by the Western interpretation of how a Soviet tank company is fielded. This is something that will require further experimentation. Overall, the fire support was timely and wholesome. I had some major trouble with ENY attack helicopters. 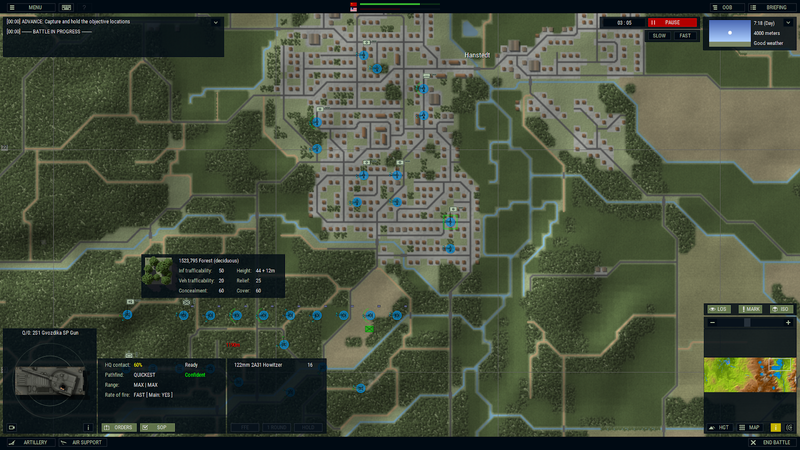 Maybe I should deploy my air defense units way more forward that what I did. 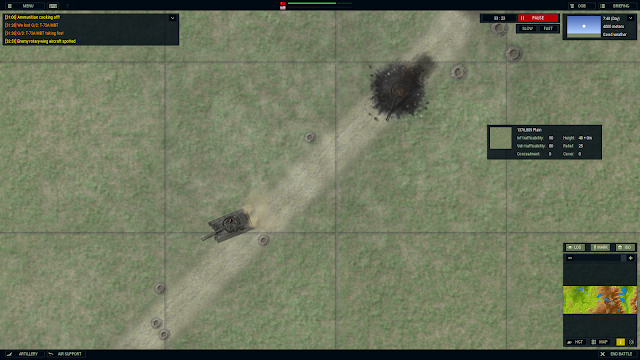 And finally, my use of recon units in such a traditional way (BMP-2 scout sections) was a pretty bad decision. As indicated by Glantz, a combination of a section of BMPs and a section of tanks would have worked best as the tip of the spear. I think the West has been egregiously guilty of swallowing (hook, line and sinker!) just about everything the defeated German “experts” could tell them in those post-war debriefings. If you look at the expertise displayed during Bagration in 44, this was assuredly not some robotic, inflexible force being led by incompetents. Ever notice how the Germans were nearly always at the wrong place, at the wrong time, after 42? Doesn’t happen by accident. 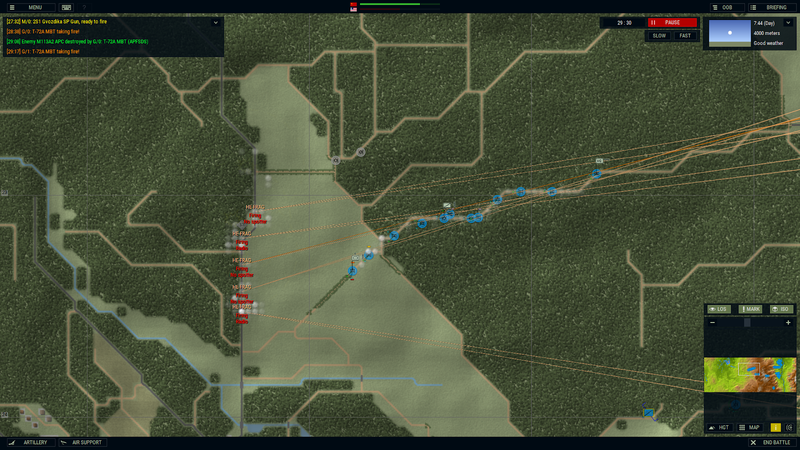 Excellent post and exactly the sort of content I was hoping to see you make up for Armored Brigade. What I've done with my air defenders is bound them just behind my lead elements, assuming they can only usefully cover while stationary (which is not the same thing as having to stop to fire because the system isn't stabilised). As a result it tends to look like recce push, screen passes, air defenders set up somewhere promising, main body comes along, and then the whole thing shunts forward again unless there's a contact that requires me to deploy from marching from point to point. I don't usually win points on tempo, as you can guess. Erich: I agree. There's a lot I want to write in response to that but it'd be a massive blog post of its own. Of interest: Notice how we talk about Battle Drills as teaching fundamentals of tactics and not to be applied unthinkingly to set situations, but can be very useful when encountering set situations because everybody knows roughly what to do even if out of contact with their leaders? How come we look at the exact Soviet equivalent of that and go "lol untermensch are incapable of tactical thought" ? Sounds like a colonial-type history problem to me. As WW2 especially should have proved, it isn't how good your elite units are, it's how good the average rifle squad leader and average battalion commander are or how "workmanlike" they can be in their consistent application of good doctrine to keep that ball rolling.